The word 'Abba' is an Aramaic word for 'father'. From what I understand, it is a very intimate expression of the word 'father' that was usually spoken by little children. In the English language, I believe it would be like a little child saying 'papa' or 'daddy'. I can't imagine how this would have enraged the religious leaders of the day! Not only was Jesus calling God His own Father, but He was teaching the people to call God their Father too! This must have really blown their theological minds! In the Old Testament, there were over 300 names to describe who God was. The most popular names that we know are Jehovah, Yahweh, Elohim, El-Shaddai and Adonai. But in the New Testament, Jesus summarized all of the names that revealed the character and majesty of Almighty God in one name... and that name was 'Father'. 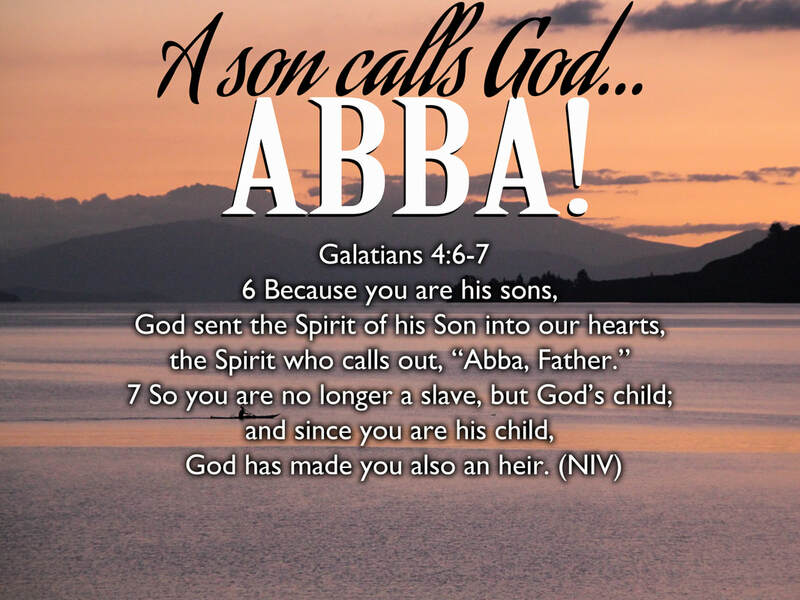 But not only can we now call God 'Our Father', we can call out to Him as our 'Abba' too!. At the most crucial time of Jesus' ministry when He was in the Garden of Gethsemane sweating great drops of blood, He cried out... “Abba, Father,” he said, “everything is possible for you. Take this cup from me. Yet not what I will, but what you will.” Mark 14:36 (NIV) The Abba cry originated in the heart of the Son and continues to resonate in the hearts of many sons and daughters around the world. While every one of the Old Testament names of God rightly describe God's majesty, His righteousness, His power and His holiness... as God’s kids, we can call Him, Abba! Jesus secured this very royal and intimate position for each one of us when He died on the cross. Through His death, burial and resurrection, Jesus has made the way for His Father to become our Father too (John 20:17). In this week's Scripture reference from Galatians 4:6-7, Paul reiterates the same message to the church at Galatia. Because we are no longer slaves, but sons and heirs of God, we now have the privilege of calling the Creator of the heavens and the earth, our 'Papa' or our 'Daddy'. Now you may be reading this blog and you might not feel comfortable with these descriptions of God and that is completely okay. When I first started to change the way I related to God as my Father, I was not comfortable with such endearing terms either. After all, He is Almighty God. But the more I called out to Him as 'My Papa' and 'My Dad', the more I realized that He likes it when I call out to Him in these ways. My prayer today is that each and every one who has received Christ would know that the Abba cry resides in the very core of our being. Jesus died so that His Father could be our Father too! May the revelation of the love of God bring all of us into a deeper sense of intimacy with Him than we have ever experienced before. May the Spirit of Wisdom and revelation (Ephesians 1:17-18) open the eyes of our hearts so that we might know our Papa better! We are not servants in our Father's house, but we are heirs of God and joint heirs with our Elder Brother, Jesus Christ! Through the blood of the Lamb, we now have access into our Father's throne room day or night where we can jump up onto His lap anytime and cry out Abba, Father!